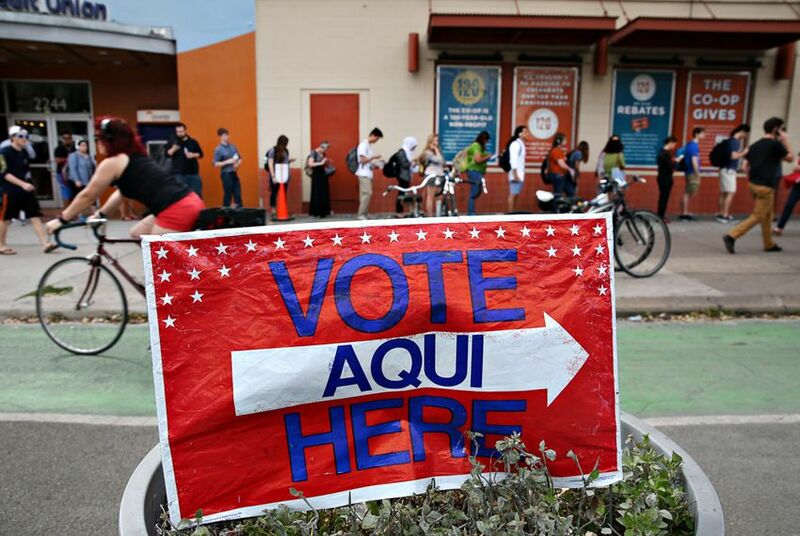 Throughout Tuesday night, Tribune reporters will keep you updated on the results of Texas' Republican and Democratic primary runoffs, from the first early voting totals through the last ballots counted. On March 1, Republican and Democratic voters decided all but 22 of their respective races for statewide, congressional, State Board of Education and legislative positions. Tuesday's runoff elections will determine who advances to the general election in November. Throughout the night, Tribune reporters will keep you updated on the results, from early voting totals through the last ballots counted. Follow the liveblog below for the latest. You can also see election night returns as they come in. You can catch up on our 2016 elections coverage here. Follow our liveblog as early results start coming in around 7 p.m. Central time. The results are starting to trickle in. In the Texas House, one interesting race to note: State Rep. Doug Miller, R-New Braunfels, is trailing 55 percent to 45 percent with early votes counted in Comal County, the biggest county in the district, and Gillespie County. Still waiting on early total for Kendall County. In another Texas House race to watch, state Rep. Wayne Smith, R-Baytown, has a tiny lead over challenger Briscoe Cain. With all the early votes counted in the Harris County district, Smith has a 62-vote lead. Smith nearly lost outright in the March primary. State Rep. Ron Reynolds, D-Missouri City, who was convicted last year of ambulance chasing and was ordered to pay more than $500,000 to a former legal client who accused him of keeping money he helped her win in a civil lawsuit, is in a good position to win re-election. He leads Angelique Bartholomew 59 percent to 41 percent after early votes have been counted. There are two U.S. House races to watch tonight. One is the 19th Congressional district in West Texas — the race to replace retiring Republican U.S. Rep. Randy Neugebauer. The other campaign is in South Texas, the race to replace another retiring member, Democratic U.S. Rep. Ruben Hinojosa in the 15th Congressional district. They key population center to watch in the 19th District: Lubbock County; the key region the 15th District is Hidalgo County, where McAllen and Edinburg are located. State Rep. Bryan Hughes, R-Mineola, leads with 72 percent of the very early vote count over 28 percent for state Rep. David Simpson, R-Longview. Just 7 percent of precincts have reported early voting totals in the Republican runoff for Senate District 1. An early read of the West Texas U.S. House race shows Lubbock Mayor Glen Robertson with a 195 vote lead over former Texas Tech Vice Chancellor Jodey Arrington out of 4,839 votes. They're both Republicans, and the winner is likely to hold the seat in the fall. This count includes 17 out of 319 precincts reporting mostly early voting returns. We're calling Senate District 1 for state Rep. Bryan Hughes, R-Mineola, over state Rep. David Simpson, R-Longview. With 8 percent of precincts reporting and early voting totals counted, Hughes led with 72 percent of the vote and was ahead in every county that had reported results so far. With 6 percent of precincts reporting, noted State Board of Education hopeful Mary Lou Bruner is trailing Keven Ellis in the GOP runoff to represent District 9 by more than 10 points. Bruner nearly clinched the Republican nomination March 1 in a three-way primary race despite extensive media coverage of her extreme right-wing Facebook posts, including one that said President Obama worked as a gay prostitute in his youth to fund a drug habit. Political experts had dubbed Bruner the favorite to win the runoff given her heavy Tea Party support. We're calling Senate District 24 for Dawn Buckingham over state Rep. Susan King, R-Abilene. With 7 percent of precincts reporting, Buckingham led with 61 percent of the vote and was ahead in every county except for King's home base of Taylor County. In the race for Railroad Commissioner, real estate mogul Gary Gates outpaced former state Rep. Wayne Christian in the early vote in some of Texas' largest Republican counties. Gates took Collin (3,412 to 2,647), Denton (3,149 to 2,444), Montgomery (4,414 to 2,875), Williamson (2,574 to 1,840) and Fort Bend (3,399 to 1,607) counties. Christian beat Gates in the Tarrant County early vote 9,110 to 7,596. Gates also bested Christian more than two to one in the Harris County early vote: 19,120 to 8,765. Gates is ahead statewide in the early vote count as of 8:10 p.m.
With 12 percent of precincts reporting, Keven Ellis is still leading Mary Lou Bruner by about 10 points in the GOP runoff for State Board of Education District 9. Returns from several counties, including Bruner's home county of Wood, still are not reflected in the totals. Now that Lubbock County returned votes, Republican Jodey Arrington jumped into a substantive lead over Lubbock Mayor Glen Robertson in the 19th Congressional district GOP primary runoff. Arrington now leads Robertson by 2,894 votes. At this point, 115 of 319 precincts are reporting, but Lubbock makes up the 19th District's major population center, and this dump could prove consequential. The Texas Tribune calls the 19th Congressional district GOP runoff for Texas Tech Vice Chancellor Jodey Arrington. At the time of the call, 70 percent of precincts reporting showed he led Lubbock Mayor Glen Robertson by an eight-point margin. Arrington is likely to hold this heavily Republican seat in the fall. With 37 percent of precincts reporting, state District Court Judge Mary Lou Keel of Harris County is leading the Court of Criminal Appeals race for Place 2 with 51 percent of the vote over her opponent, District Court Judge Ray Wheless of Collin County, who has 48 percent. In the race for Place 5 on the court, candidate Scott Walker is ahead with 58 percent of the vote while his opponent Brent Webster, a Williamson County assistant district attorney, has 41 percent. The GOP runoff for the Texas Railroad Commission remains very tight. With 73 percent of precincts reporting, former state Rep. Wayne Christian has 50.7 percent while Gary Gates is at 49.3 percent. Baytown attorney Briscoe Cain has built a small lead over incumbent Rep. Wayne Smith, R-Deer Park. Cain trailed after early voting, but now leads by 83 votes with 83 percent of precincts reporting. If that lead holds (and with a margin that slim, that's certainly not a guarantee), the anti-House Speaker Joe Straus crowd will have knocked off two House committee chairmen. The Texas Tribune calls the Texas 15th Congressional district Democratic primary race for attorney Vicente Gonzalez. He defeated Edinburg School Board Member Juan "Sonny" Palacios, Jr. Dawn Buckingham offered the following statement on her victory: "I am truly humbled by the people of Senate District 24 and cannot thank them enough. It has been an honor traveling across the most beautiful part of Texas and meeting so many fantastic people. I look forward to being the conservative voice at the Capitol!" It's official: State Rep. Ron Reynolds, D-Missouri City, has won re-election. He was convicted last year of ambulance chasing and was ordered to pay more than $500,000 to a former legal client who accused him of keeping money he helped her win in a civil lawsuit. Still, all the votes are counted, and he has defeated Angelique Bartholomew 53 percent to 47 percent. It doesn't get much closer than this: Deer Park attorney Briscoe Cain has defeated state Rep. Wayne Smith, R-Baytown by 23 votes. A recount is likely, but if the results hold Smith would be the second House committee chairman to fall tonight. The Tribune calls the Republican runoff for Place 5 on the Court of Criminal Appeals for Fort Worth criminal defense attorney Scott Walker, who has 58 percent of the vote with 84 of precincts across the state reporting. His opponent, Brent Webster has 41 percent. Now, the Tribune is calling the Republican runoff for Place 2 on the Court of Criminal Appeals. State District Court Judge Mary Lou Keel of Harris County won with a thin margin – 50.93 percent of the vote. Her opponent, District Court Judge Ray Wheless of Collin County had 49.06 percent with 91 percent of precincts across the state reporting. All 22 races are now called. Check our election scoreboard to see how they all came out.